According to an Special Alert from the U.S. based law firm Manko, Gold, Katcher, Fox LLP (“MGKF”), the rules of the road applicable to facilities generating hazardous waste will change significantly in 2017 due to promulgation by the U.S. Environmental Protection Agency (“U.S. EPA”) of the final Hazardous Waste Generator Improvements Rule, which was published in the Federal Register on November 28, 2016 (81 Fed. Reg. 85372). The Hazardous Waste Generator Improvements Rule represents the first major overhaul of the generator regulatory program, which has evolved piecemeal since the 1980s. The U.S. EPA has reorganized the regulations to make them easier to navigate. Allowing very small quantity generator (VSQG) and small quantity generators to maintain their existing generator category subject to certain conditions despite an unusual “episodic” event that would otherwise bump the facility to a higher category. In addition to finalizing key flexibilities, the rule enhances the safety of facilities, employees, and the general public by improving hazardous waste risk communication and ensuring that emergency management requirements meet today’s needs. These changes impact areas such as making hazardous waste determinations, managing waste in satellite and central accumulation areas, labeling containers and tanks, and developing emergency planning and preparedness procedures. In the enforcement context, the rule distinguishes between violations of “independent requirements” applicable to facilities simply by virtue of being generators, and failures to satisfy “conditions for exemption” that allow a facility to avoid obtaining a hazardous waste permit. Facilities found to have neglected exemption conditions – many of which (like labeling a drum) appear relatively minor on their face – could experience significant consequences if deemed to be operating without a permit. The rule becomes effective on May 30, 2017. States authorized to implement the hazardous waste program will be required to adopt changes in the rule that are more stringent than the current federal program, and will have the option of adopting less stringent changes. MGKF recommends facilities take time over the next few months to become familiar with the rule and be prepared to make any necessary adjustments before regulatory agencies begin enforcing the new requirements. The Canadian federal government recently introduced proposed Asbestos Regulations. It also issued a Notice to manufacturers, importers, exporters, and users of asbestos and asbestos-containing products. Under the proposed asbestos regulations, a prohibition would be placed on all future activities respecting asbestos and asbestos-containing products, including the manufacture, use, sale, offer for sale, import and export. The Canadian federal Government Notice required industry to submit information on the manufacture, import, export, and use of asbestos and products that contain asbestos. The information gathered will be used to inform the development of the proposed regulations and will ensure that future decision making is based on the best available information. As a first step in the consultation process, interested parties were given the opportunity to submit comments on the approach set out. Subsequently, interested parties will also be consulted in the spring of 2017, and additional information will be available on an asbestos information web page: Interested parties will have another opportunity to make written comments specific to the regulatory proposal during the mandatory consultation period that will follow the publication of the proposed regulations in December 2017. Asbestos (Chemical Abstract Service Registry Number (CAS RN) 1332-21-4) is a commercial term given to six naturally occurring minerals that are incombustible and separable into filaments. The Government of Canada recognizes that breathing in asbestos fibres can cause cancer and other diseases, such as asbestosis, mesothelioma and lung cancer. More information about the health impacts of asbestos can be found at Mesothelioma and Asbestos Awareness Center web site. The U.S. Pipeline and Hazardous Materials Safety Administration (PHMSA) recently issued a rule to improve pipeline operational safety, including a requirement for faster notification following a spill. The rule says the operator must electronically or telephonically report notice of an accident or incident within one hour of confirmation, PHMSA said in a statement. There have been growing concerns regarding the safety of pipelines transporting hazardous liquids, after activists spent months protesting plans to route the $3.8 billion Dakota Access Pipeline beneath a lake near the Standing Rock Sioux reservation, saying the project poses a threat to water resources and sacred Native American sites. PHMSA’s rule also includes provisions for operator qualification, cost recovery and other pipeline safety changes and will become effective 60 days from the date of its publication in the Federal Register. It is scheduled to be published in the Federal Register on Jan. 23, 2017. PHMSA said the rule also amends drug and alcohol testing requirements. It now requires drug testing of employees after an accident and will allow exemption only when there is sufficient information that establishes the employees had no role in the accident. The proposed changes come after incidents such as in 2010 when an Enbridge Energy Partners pipeline spill near Michigan’s Kalamazoo River leaked crude oil for about 17 hours before it was confirmed by control room operators. Pipeline leak detection systems typically relay information to a control room, where trained operators are often required to distinguish between false alarms and real leaks. As recently reported in the Hamilton Spectator, the Ontario Government stated it will assume the environmental legacy issues associated with contamination at the Stelco property in the north end of Hamilton. The reason for the decision by the Ontario Government is to make it easier for the sale of the company and keep steelworker jobs. U.S. Steel Canada (Stelco) is the current owner of the steelworks and is in negotiations to sell the company to Bedrock Industries, an American investment fund. As part of the sale-purchase agreement, Bedrock Industries was reportedly willing to put forward $80 million in a one-time payment that would partially fund the clean-up. The environmental clean-up costs at the Stelco property is unknown but could be astronomical. As a point of reference, the Canadian and Nova Scotia governments committed $400 million in 2007 to clean-up contamination from the steel plant in Sydney, Nova Scotia. The commitment by the Province of Ontario to backstop the future environmental clean-up costs in order to aid in the sale of a company is a first in the Province. The reasoning behind the decision is that it makes the Stelco and the lands it sits on a potentially valuable investment. Any costs bore by the Province in clean-up would be balanced by the taxes and other benefits accrued with the infusion of new ownership in Stelco and redevelopment of unused lands at the property. All 325 hectares of Stelco property off Wilcox Street would be turned into a land trust administered by the province, union representatives and probably other parties such as the city and the Hamilton Port Authority. The land trust then would lease 120 hectares back to Stelco. The company would then be able to operate without fear of costs associated with the contaminated ground it is operating on. The remaining 200 hectares or so would then be remediated to an industrial use standard with the contribution from Bedrock and potentially other funds. That land would then be sold or leased. Profits from the sale or lease would then be used to assist in shoring up pension funds for Stelco workers as well as to help finance benefits to pensioners. The land proposal is part of a larger deal that as part of U.S. Steel’s Companies’ Creditors Arrangement Act (CCAA) proceedings that have been continuing for two years. CCAA has been compared proceedings under “Chapter 11” of the “Bankruptsy Code” in the United States. If successful, Stelco will emerge from creditors’ protection under Bedrock ownership with a new lease on life. The Ontario Ministry of the Environment and Climate Change (MOECC) recently updated the Guideline for Training Requirements for Drivers of Waste Transportation Vehicles (Guideline C-12, PIBS 7914e01). The driver training guidelines are applicable for drivers who transport municipal waste, liquid industrial waste or hazardous waste. For more information on driver training requirements, contact the John Nicholson, the editor of Hazmat Management Magazine. As reported in the Edmonton Sun, the Alberta Energy Regulator (AER) recently fined Murphy Oil Company, based in Calgary, with environmental fine as a result of an incident in which oil spilled from an oil pipeline in 2015 near the Peace River. AER issued a $172,500 administrative penalty to Murphy Oil Company after in concluded that an undetected spill about 490 km northwest of Edmonton released 1,429 cubic metres, or 1,429,000 litres, of condensate into the environment from approximately January 15 to March 1, 2015. 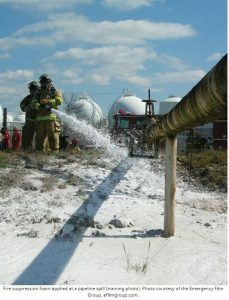 An AER investigation found that Murphy Oil failed to take reasonable action to ensure the leak detection system on the pipeline was capable of detecting early leaks, failed to evaluate operating or discontinued pipelines, failed to report the release of condensate, and failed to clean the spill, which caused damage to public lands, including soil, and a water body. The company has been found in breach of a number of provincial legislation’s, including the Public Lands Act and the Environmental Protection and Enhancement Act. The pipeline has since been repaired as Murphy Oil continues to clean the impacted area.